It’s my last night in Brugge – tomorrow I will take the train back to Amsterdam, closing the circle that I created when I flew from Amsterdam to Oslo last month on July 18. It’s quite sad to leave Brugge – I really like this town. Its atmosphere and buildings, the cobblestoned streets and alleys, its helpful and courteous locals who smile more freely – I’ve had a great time here. You may not find enough attractions to discover everyday if you stay in Brugge for too long. Two nights seem more than ample – but leaving Brugge is like saying goodbye to a newly-found friend. I did also ‘meet’ Brugge’s more down-to-earth sibling, Ghent. After breakfast, I took the 30-minute train to Ghent and then took the tram to the city centre around Korenmarkt. Knowing that I only had limited time set me on a couple of Ghent’s landmarks that I wanted to visit. I made my way to the Het Gravensteen – a medieval castle a short stroll away from the city centre. There’s a movie that you can watch on a small portable device as you move from one spot to the next (helpfully numbered). The movie depicts how life was in the medieval time through the key characters: Filip and Mathilde. The cost of the movie guide is included in the admission ticket of €8 (less for students and children). I watched the movie from the introduction until the second spot, but it was getting quite cumbersome having to juggle the camera, my backpack, and the device, so regrettably I returned it to the desk. They probably thought that I was a ungrateful philistine who couldn’t appreciate the history of the place. Sorry! The castle complex is interesting though – the numbered panels do give good explanation on what the areas represent in the medieval time. You go through the tower, the meeting hall, the cellar, the walkway, and even the torture chamber and the latrine! 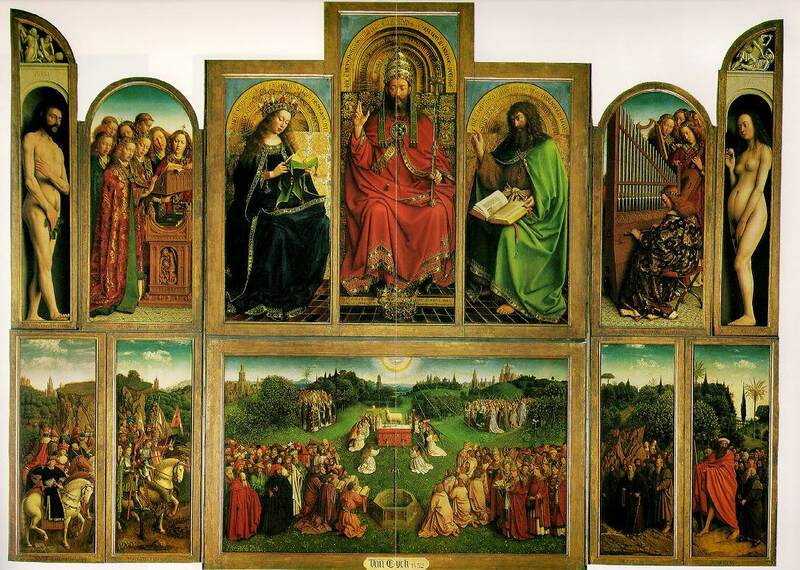 The other place that I wanted to see was the Adoration of the Mystic Lamb, a panel-painting that was magnificently created by the brothers, Hubert van Eyck and Jan van Eyck in the 1400. It is housed in the chapel of the Cathedral of St. Bavo in Ghent, and inside the chapel, you can get an audio guide explaining what each panel represents. The painting is beautifully detailed – the audio guide says everything is so precise and detailed, even the singers on the second panel of the upper part can be distinguished on who’s the main singer, and who’s doing the alto and so forth! The name of the painting refers to the figure of Jesus Christ as the Lamb of God, in the centre panel on the lower part. The figures on the upper part are Adam and Eve, the heavenly singers and musicians, and Mary, the mother of God, and John the Baptist, on each side of the central figure. The audio guide mentions that there are ongoing debate on who the central figure is, whether it is God the Father or Jesus Christ, because there are elements that support each side of the argument. Really fascinating! I took the train back to Brugge at 3.00pm – leaving me enough time to explore some more, visit the local apotheek (chemist’s) for an antiseptic solution that I normally use. They don’t sell it in Belgium unfortunately, but the chemist at Apotheek Priem on Noordzandstraat was really helpful in finding out the key ingredient and recommending an alternative. He was really friendly and didn’t just brush me off. Such simple experience compounded my positive feelings for Brugge. I also couldn’t resist buying some more macaroons from Detavernier – the place where I bought some the day before. To conclude my trip in Brugge, I took the boat tour around the canals at 5.30pm – we got to explore different parts of Brugge which gave me an idea on which area that I hadn’t been before. I had another walk afterwards to revisit some of the spots, such as the Jan van Eyck statue. For dinner, rather than spending a large amount of money, I opted for a more down-to-earth affaire at Frituur Joepyjee. The lady humoured my limited knowledge of Dutch/Flemish and after I mentioned that this was my last night in Brugge, she offered to suggest a dish that she said I would like. My dinner was frites with fried skewered beef seasoned with paprika and other spices. Really tasty! The beef was well-marinated, so I could taste the flavours as well. I couldn’t get the Flemish name of the dish though – when she said it, it was impossible for me to remember or transcribe. Does anybody know? So that’s it folks – tomorrow I will head off back to the wonderfully cheeky Amsterdam. I will take the train around 11.00am, and it should take about four hours for me to reach Amsterdam via Antwerp. It’s sad to say goodbye to Belgium as I have really enjoyed my stay here – from the un-boring Brussels, the charming Brugge, and the down-to-earth Ghent.